The Old White was the first of three 18-hole courses to be constructed at the famous Greenbrier resort, opening in 1913. Named after the Old White Hotel that was in use from 1858 to 1922, the course was designed by the legendary architect Charles Blair Macdonald. His associate Seth Raynor carried out some modifications to soften the layout a decade after it opened as resort guests deemed the course too difficult in its original format. The course today retains much of the character of a parkland course constructed a century ago with tight, tree-lined fairways leading to small, well-guarded greens. Much of the credit for this is due to architect Lester George who carried out an extensive renovation program that was completed in 2006. George installed new drainage and paths and, with the assistance of Greenbrier historian Bob Conte, he studied old aerial photographs of the course before embarking on a plan to plant a significant acreage of tall fescue grasses around the course and cut back a substantial number of the trees that bordered the fairways. Par is set at 70, largely because there are only two par fives on the card, both of which appear on the back nine at holes 12 and 17. 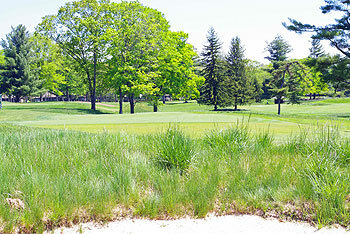 As a consequence, the strength of the layout lies in its par four holes and one of the best of these – some say the hardest – is played on the opening hole, a 449-yard, slight dogleg to the right that begins from a gun platform tee box overlooking a stream that meanders through from holes 15 to 18. The green for the marvellous little par three 18th lies adjacent to this position and it’s a fine setting for a home hole, played uphill across water to a highly contoured putting surface in front of the clubhouse. The Greenbrier Classic, a FedExCup competition on the PGA Tour, was held here in 2010 and it’s the first of six such annual events contracted to the Old White course. Stuart Appleby shot an incredible 59 on the final day to win the 2010 title by one shot with a total score of 22 under par for the competition. The course won a number of golf magazine best remodel awards after Lester George’s work was carried out in 2006. A decade later, terrible flooding destroyed parts of the layout, causing the cancellation of the 2016 PGA Tour event at The Greenbrier. Within weeks, architect Keith Foster and contractor McDonald & Sons stepped in to quickly repair the damage (rebuilding green complexes and removing cross bunkering to improve playability) which allowed the Old White to host the Greenbrier Classic as normal the following year. I have played the Old White course twice in the past 3 years, the most recent being May, 2013. I absolutely LOVE this course and how it has been restored to Raynor's original design. The holes are interesting visually and offer up so many strategic options. The conditioning is excellent (as is EVERYTHING at the Greenbrier -- a great resort) and should be for the cost of a round. The quirky design elements, indicative of Raynor's touch and CB MacDonald's influence, are a delight and do not detract from the naturalness of the course, nor are they so pervasive or obvious that they jump out. Truly a treat to play this course and think your way around each hole! Deserving of 6 balls, but I am giving it 5, due to the high cost, which detracts from the playability. 13 Index.